Ladies, are you ready? On your mark! Get ready, Get set, Go! Remove the mask, motivate yourself, feel good about who you are, believe in yourself, and take charge of your life. If you think it, you can dream it. If you dream it, you can achieve it. If you achieve it, you can become it. Let nothing or no one stop you from becoming all that you can be. Look up and keep moving – the sky is your limit. Cassandra Burckhalter is a motivational speaker and author. She is the founder of Women Working Together to Make a Difference, an organization that offers positive leadership and guidance for women of all ages; and Torch of Inspirations. 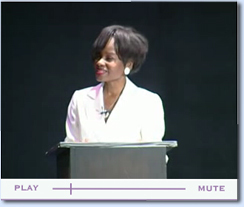 Torch of Inspirations makes available her services as an exciting and energetic spokesperson and MC, as well as a motivational speaker. Her new book, The Hot 100 Echoes of a Woman's Thoughts, (seen on Live with Regis & Kelly) enables women to look at life from a different point of view. Women Working Together is a unique company designed to motivate you To Make A Difference in every aspect of your life — work, family, community and, most importantly, within yourself. We focus on self-empowerment, improving communications and leading change. Professional services include Motivational Speaker, Panelist, Master of Ceremony, Moderator, Keynote Speaker and Workshop Speaker. In one sense, many of us project an air of self-confidence – after all, we excel in the workforce, we nurture our children, we strive to be good partners with our husbands, we may take care of our parents and we may volunteer in our community. We meet everyone’s expectations … but not our own. For most of us, that’s a hard confession. But when you’re all alone, and you remove whatever “masks” you project, are you unhappy? Lonely? Maybe even depressed? Do you ever wonder how life ended up this way? Far too many of us mold our lifestyles to reflect what others define as a happy life.That’s great for others, but does this give you genuine confidence and happiness? Other support groups and organizations are designed to help “working” women. Women Working Together is designed to motivate you To Make A Difference in every aspect of your life – work, family, community and, most importantly, within yourself. Motivational Topics: Remove the Mask, Motivate Who! Lets Communicate, Looking Good and Feeling Good, and Take Charge of Your Life. I personally invite you to see Cassandra "in action" for yourself. Act now! Seen on Live with Regis & Kelly! 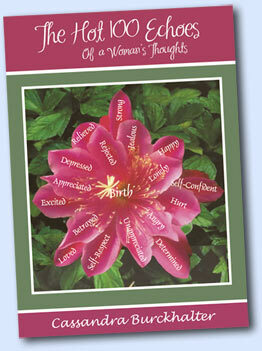 This exciting book is designed to enrich the lives of women from all walks of life. It reveals some of the inner thoughts that are common to women, while offering motivational tips to deal with those thoughts. It will motivate women to look at their thoughts from a different point of view. Thought #40: I want to be loved. Motivational Tip: We all want to be loved by someone. However, before we can appreciate another person’s love for us, we must learn to love ourselves. Do you love yourself? Don’t miss this opportunity to see what other women are thinking. Get the paperback or e-book of The Hot 100 Echoes of a Woman's Thoughts now! The Kindle Editon is now available! Secure payment processing by Paypal. Please allow one week to 10 days for delivery.